It’s Halloween tomorrow which means it’s time to make everything spooky! I decided to spoop out my nails with some ghost nail art! This was really easy to achieve and only involves two colors. This is a great nail art for beginners or those with little skill. Ghosts can be all sorts of shapes, so if they aren’t perfect, that adds to the spookiness! 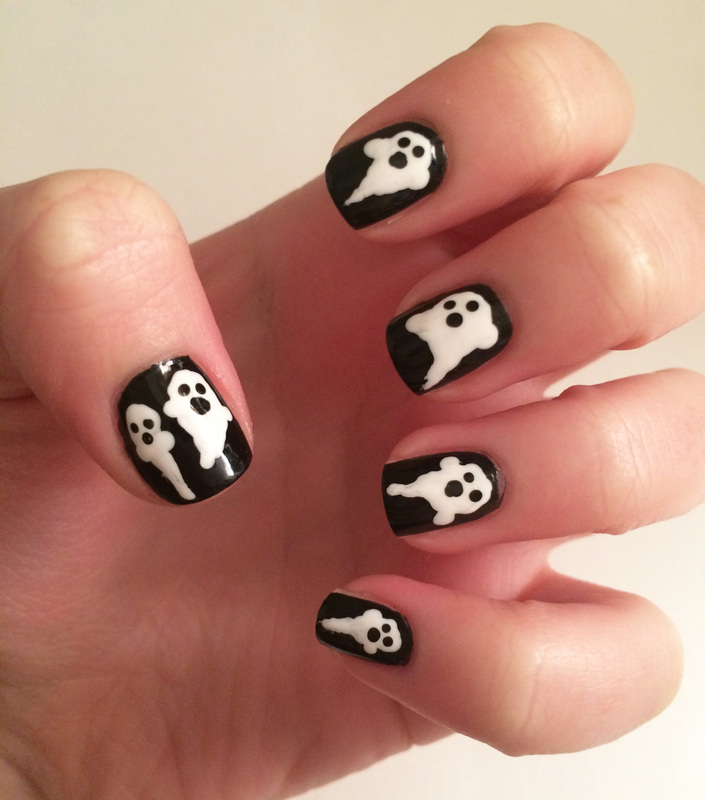 Read below to see how I got this spook-tastic nail art. Paint your base coat as normal. Paint two layers of black nail polish. I used China Glaze Liquid Leather. Let dry for 10 minutes. Pour some white nail polish onto a plate. I used OPI Alpine Snow. Use a white that is really opaque. If you have it, use acrylic paint instead. It is more opaque than nail polish and won’t become thick and tacky like nail polish will. Using the larger dotting tool, create the ghosts with the white nail polish or acrylic paint. I outlined the head first then created a squiggly tail towards the end of the nail. I then filled it in. I made the ghosts tilted at different angles and put two on my thumb. Dot two white arms next to each ghost. Let dry for 10 minutes. Pour some black nail polish or acrylic paint onto a plate. Using the smaller dotting tool, dot two eyes and a mouth on the ghost. I made the mouths bigger than the eyes. Let dry for ten minutes. Add top coat. I used HK Girl Glisten & Glow top coat. It doesn’t smudge nail art and dries super fast. Clean up any mess with a cotton bud or a brush dipped in acetone. You’re done! It seems really complicated, but in all this took me 30 minutes and that included drying time.